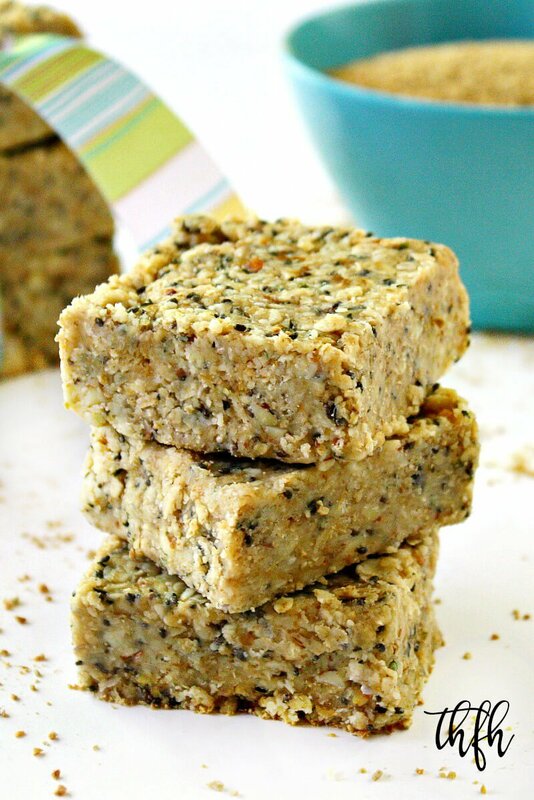 If you’re looking for a no-bake, nutrient-dense snack, this Clean Eating No-Bake Raw Hemp and Chia Seed Bars recipe is just for you! They pretty much have all of my favorite ingredients…hemp seeds, chia seeds, coconut oil, and nut butter and they can be prepared in under 10 minutes. Loaded with protein, calcium, healthy fats and fiber, these bar are perfect for snacks and even as a breakfast bar. After separating the wet and dry ingredients, all you need to do is mix everything together in a bowl and then let them firm in the refrigerator before enjoying. No baking or oven needed! This healthy recipe is raw, vegan, gluten-free, dairy-free, egg-free, soy-free, no-bake and contains no refined sugar. Want more healthy dessert recipes? Check out Gluten-Free Vegan No-Bake Caramel Apple Bars, Gluten-Free Vegan Chewy Nut and Seed Bars, Gluten-Free Vegan Pecan Pie Bars or my Clean Eating Cookbook with 3 entire chapters of healthy, clean eating recipes just like this one that you will love! Tip #1: Add an extra 1/4 cup of melted coconut oil if you want yours to be more compact and dense (as in the photos) as opposed to a more granola type bar. Tip #2: The recipe makes 6 large granola size bars or 12 squares (shown in the photos) or 48 tiny squares (cutting the 12 squares into 4 pieces each). My husband, who can eat 5,000 calories a day and not gain one pound gets the large size, my boys who have no problems with extra calories and healthy fats gets the square size and I get the tiny bite size pieces. I usually take one of the squares and cut it into 4 tiny pieces and nibble on it throughout the day. One of my favorite afternoon treats is one of the tiny pieces with a cup of herbal tea. Tip #3: They will freeze or refrigerate well – just keep them in an air-tight BPA-free container and store in the refrigerator or freezer until you are ready to eat them. They will get soft if left out at room temperature. Add the almonds to a food processor and process until they are chopped into tiny pieces, taking care not to over process. Set aside. Add all the dry ingredients to a medium-sized bowl and stir until well combined. Set aside. Add all the wet ingredients to a separate medium-sized bowl and stir until well combined. Add the wet ingredient mixture and the almond pieces to the bowl of dry ingredients and stir until well combined, using your hands to mix if needed. Transfer the mixture to an 8 x 8 baking dish lined with parchment paper. Spread the mixture evenly and press it down firmly into the bottom of the baking dish. Put the baking pan in the refrigerator for about 30-60 minutes, or until the mixture is firm. Cut into even size bars or smaller squares. Store in the refrigerator in an air-tight BPA-free container until ready to serve because they will get soft if left out at room temperature. The recipe and photographs for "Clean Eating No-Bake Raw Hemp and Chia Seed Bars" by Karielyn Tillman of The Healthy Family and Home website are licensed under a Creative Commons Attribution Non-Commercial No Derivatives 4.0 International License and cannot be used without my written permission. Thanks Karielyn, These are now going to be my go-to protein-rich, nutrition-dense snack. I added extra cocoa and cinnamon since I love that flavour combination. I made these yesterday, and they are delicious! I was a little nervous buying dried mulberries for the first time because they look like little, dried-up brains, but they’re great! Thanks for introducing me to them! Hi there! I’m so glad to hear that you tried out the recipe and I love the adjustments you made to it. You are right, the dried mulberries ~do~ look like little brains lol! They are really good to snack on and eat plain too. They are added in the recipe for the extra nutrition, but if you don’t like them you can always leave them out. How many carbs in those bars? I am on low carb diet can I eat these? Hi there Bob! I haven’t calculated the nutritional data for the bars, but another reader did a calculation and came up with 30 carbs for 1/12 serving. However, when I make an 8 x 8 pan, I cut them into 16 large squares which would make the carb count a little less. You could also cut those 16 large squares into 1/4 pieces for a total of 64 bite-sized pieces and you could eat a couple at a time instead of a large piece and that would dramatically less at about 7.56 carbs (or a little less) per bite-sized piece. They may not be the most carb-friendly treat but they are made with clean, real food ingredients. Just popped all the ingredients into cronometer. A 50g serving is 218 calories: 5.9g protein, 17.8g carbs, 12.4g fat. As a percentage of calories: fat 48%, carbs 42%, protein 10%. Good ratio of omega3-omega6 (around 1:2.5). Hi there Nancy! I’m so glad to hear that you enjoyed the bars! I don’t know how much protein is in the recipe, but you can input the ingredients into a calculator like “CalorieCount.com” and it can calculate it for you. In preparation for my baby’s birth in a couple of weeks, I made a batch of these today to snack on while I’m in labor (I live in Denmark and here they encourage women to eat and drink lightly while in labor so to keep the energy levels up). I tried the dough and it was delicious, they are still not ready because I just finished making them, but I’m sure they’re gonna be great and even more delicious once they set in the refrigerator. I added some extra ingredients to the recipe: organic pumpkin seeds, raw cacao nibs and dried cranberries. I also substituted 1/4 almonds for about 1/2 cup of almond pulp I had from after making almond milk; and I also used whole chia seeds and grounded as well, so half and half to reach the amount the recipe calls for. Hi there Lizy! First, congratulations on your new baby…how exciting!! Second, I’m so excited you’ve chosen a real food, clean eating snack to nourish your body during a very important time! Oh my gosh, I -love- the extras you added in, especially the cranberries and cacao nibs…yum! I just want to make sure you know to keep these very cool, or better yet frozen, because they will get soft and lose their shape if left out at room temperature due to the coconut oil. Other than that, I think they will be the perfect snack. I wish you the very best during your delivery and hope everything is super easy for you. Hi there Megs! I’ve actually tweaked this recipe a couple of times and originally it had 1 cup of raw honey and no applesauce. I found it to be too much sweetener for me (I don’t like my desserts too sweet), so at the suggestion of one of the commenters, I reduced the raw honey to 1/2 cup and added 1/2 cup of applesauce as a substitute. So…you could use 1 cup of raw honey (or maple syrup) and omit the applesauce and it would work just fine. i love these bars! they are great filling snacks to have throughout the day, but they easily turn into granola. my husband is a helicopter mechanic and only gets one 10 min break in his 10 hour shift, and he would love to have this snack with him to keep him filled. unfortunately he cannot grab the granola pieces with his hand because they are covered in oil. any suggestions to keep them compact while they are in his pocket and hes running around? we would love to know your input! Hi there Jessica! Yes, these would not be the ideal “portable” or “on-the-go” snack because of the coconut oil. When refrigerated, it is what helps keep the bars intact and hold them together, but at room temperature, the coconut oil will “melt” and the bars will become soft and lose their shape. So…I would try to reduce the coconut and maybe use some medjool dates, which are sticky and another good ingredient for holding things together. I would start with 1/4 cup of coconut oil and 4 – 6 large medjool dates (pitted). Check the texture, you may have to play with the ratios a little bit to get it just right. But the goal would be to try to reduce the coconut oil as much as possible and offset it with enough dates to “hold” them together. Then he wouldn’t have as big a problem with the messy oil. Another suggestion would be to make them in to balls, instead of bars. Just take them out of the food processor in spoonfuls, squeeze the mixture in the palm of your hand tightly, then roll them into the shape of a ball. That way instead of trying to carry around a bar that could fall apart easily, he could just pop a bite-sized ball in his mouth. Hi there Jess! I haven’t figured the calories for this recipe but I think in the comment thread a couple of readers have calculated them. One reader calculated 400 calories for 1/12 the recipe and another reader calculated between 300 – 350 calories for 1/16 of the recipe. Don’t panic though! 🙂 One thing to remember is although a complete bar might have 300 – 400 calories, it’s not the same as eating a 400 calorie fast-food hamburger. The ingredients used are real whole food, high quality and nutrient-dense which means they will nourish your body unlike other unhealthy foods with empty calories. That said, I wouldn’t eat 5 of them at a time. What you could do is divide the big square into 4 smaller squares and that would bring the calorie count down to around 100 calories per piece. I try to go with this theory…count nutrients, not calories, because lower calories foods are not always better. What ingredients come with those lower calories and are they helpful or harmful to your body and health? Even though it only has 100 calories, look at the horrible ingredients (GMO’s, preservatives, artificial flavors, high fructose corn syrup, refined sugar and salt, etc) that will do nothing to nourish your body and will leave you needing to eat something else. Which in turn will mean more calories, because those are are empty calories. So, I hope that example helps a little and that it will help you to enjoy the Hemp and Chia Seed Bars, in moderation, guilt-free. I made your hemp and chia bars tonight with a few modifications and they look great! I chose not to use honey and just used a bit of Stevia and cinnamon to sweeten it. I also didn’t have any applesauce in the house but I had a ripe banana that I mashed up instead. Yummy! I also believe the only way to lifelong weight loss is through eating healthy, nutrient dense foods. Say no to the yo-yo! Hi there Justina! I’m so glad to hear you enjoyed the Hemp and Chia Seed Bars and I love the substitutions you made! One of the reasons I like these so much is because they are so versatile and you can easily make substitutions or changes based on what you like and have on hand. Hey Karielyn! I featured your awesome Raw Hemp & Chia Seed Bars recipe on my Vegetarian/Krishna conscious eating blog page to help spread the word about TheHealthyFamilyandHome.com! Hi there Nancy! You are so sweet…thank you so much! You have a nice selection of recipes on your post and I’m glad to be included on your list. Great recipe. Been making these for a daily breakfast. However, for the second batch, I did a little tweaking. I added 1/2 teas salt, mixed the almonds with pistachios, a few drops pistachio extract, currants and shredded coconut. The coconut oil needed to be slightly adjusted upward to accommodate the added ingredients. As afar as calories, I divided the brick into 16 bars. It holds me for 4 hours in the morning. That should bring the calorie count between 300 and 350. So far, I’ve dropped 3 lbs this past week. The bars have made a regular staple in our diet. Hi there Steve! I’m so glad to hear that you are enjoying the bars…AND that you are even experiencing some weight loss!! You can’t beat that! One of the great things about this recipe is that it is very flexible and easy to make substitutions. I love how you added the pistachios, almonds and coconut. I’ve never tried or used pistachio extract or currents so I may need to look into that. The other thing I love about them is because they are so nutrient-dense and have healthy fat (from the coconut oil), I, too, stay satisfied longer and don’t have sweet cravings. As a side note to your weight loss…the only time I have ever been able to lose weight is when I ate foods like these and I ate whatever I wanted, whenever I wanted and the weight just fell off. I never had to count calories or carbs, etc and I’m sure I was eating well over 2,000 calories a day eating these bars alone, but I still lost weight. But it is important to note that when I said I ate “anything I wanted”, I meant clean, nutrient-dense foods (mostly raw) with healthy fats. It’s like my body was saying ‘thank you thank you” for finally giving me what I need to work right lol. Can’t wait to try these…. It’a a personal decision for me because the healthiest I have ever been and the only time I was ever able to lose weight and keep it off was when I stopped counting calories, etc and focused on eating healthy, nutrient-dense foods, healthy fats and real food with unprocessed ingredients. I still don’t understand it even now, but I could eat whatever I wanted (and some days I know my caloric intake was well over 2,500 calories a day, especially snacking on bars such as these) and the weight would just fall off. I guess once my body was nourished everything started working like it is supposed to…for me. But I know everyone is different and people need nutrition info for lots of reasons so when I’m asked for nutritional data for a recipe, I will usually refer them to a website that can calculate the info for them. Hi, Thank you for the recipe,I share it with some of my friends they all enjoyed it. my husband and love it. but we can’t do oats what can i use as a sub? can you let me know what you would use. Hi Gail! Hmmm…I’m thinking maybe some almond flour? Or, I’ve made some bars before using organic rice puffs cereal with the only ingredient is 100% organic brown rice. I put them in a food processor and process them into smaller pieces and it worked really good. I haven’t tried either of those before, but if I were to make them using a substitute, that’s what I would try. Made these this afternoon and wow! they’re fantastic; not too sweet and very satisfying. (I did up the applesauce and lower the amount of honey a bit, as someone above had mentioned trying with success). I think I feel healthier already after just one little square. =) Thanks for sharing this great recipe. Hi Nic! I’m so glad you enjoyed them! The last couple of times I’ve made them I used the reduced honey + applesauce suggestion too and actually prefer that better. I may edit the recipe to reflect the change because I never did like that much sweetener in them to begin with. I made your bars again and made a few changes and they turned out really yummy! Emily…these are amazing! I love the addition of cinnamon (because it’s good to maintain healthy blood sugar levels). What do you do with the Brazil nuts since they are so big….do they just get pulsed into smaller pieces in the food processor? Heading the to grocery store this morning and am going to get some Brazil nuts (for the first time!) and some more applesauce since I’m out. Also I am sharing this recipe because I think you would love it. Just made it tonight using a little less goat cheese then recommended. I’m curious about making them vegan without any cheese at all and will try this next time. Hi Emily! Oh my…that does look really good. Looking it over, I’m thinking it would be a great way to use beet pulp leftover after making juice. The eggs could easily be substituted with flax eggs (1 tablespoon ground flax seeds + 2 tablespoons of water). Not sure what a good replacement for the goat cheese would be but I’m thinking it would be good without it too. I’m going to bookmark this to try later (with a link back to the source) and see how it comes out. Hi! I loved making this recipe. I used almond extract instead and added some Brazil nuts (good for your hair!) and gogi berries. Yum! Hi Emily! I’m glad to hear you enjoyed the recipe! I think Brazil nuts are probably the only type of nuts I haven’t bought yet, but I bet they were good. Now goji berries…they are a staple in my house but I probably was out when I made these or I definitely would have added them in to get extra nutrients. Thank you for sharing this great recipe! I adopted your recipe and made it as cookies. I put slivered almonds and cranberries. YUM! Hi Jen! I love your idea of adding the almonds and cranberries…I bet that was really good! Hi! Are there any healthy susbstitutes for the coconut oil and the honey? I did 12 squares for a Weight Watchers recipe, and it came out at 14 points a bar! That is very high! Also, for the almonds and flax, is the measurements for when they are both already ground or before they are ground? Thank you for any assistance you can provide! It looks great!!! Hi Anya! You could reduce the honey (use 1/2 cup organic applesauce + 1/2 cup honey) and that will work fine, I’ve actually used that substitution and will amend the recipe next. I never was happy with that much sweetener in them and that’s way more than I normally use in a recipe. You could reduce the coconut oil (use 1/4 cup almond butter + 1/4 cup coconut oil). The 1/4 cup of almond butter is in addition to the other amount of almond butter listed in the recipe. I haven’t made this substitution, but another reader did and said it worked fine. The measurements/amounts for the almonds and flax are ~before~ they are ground…good question! Just throwing this out there…this is not a low calorie snack, but – they are super high in nutrients and healthy fats which is much better for you. You can sometimes have a low calorie snack, but what are you sacrificing for the lower calories? What kind of nutrition are you getting and how clean are the ingredients (are they highly processed, preservatives, additives, GMO’s etc). My other suggestion would be to do what I do when I make these. I make the 9 x 9 pan of them, and instead of cutting them into 12 large squares, I cut each of the 12 squares into 4 pieces. That way you will have 48 bite-size squares to nibble on throughout the day. Because they are so nutrient dense, they will be more filling and satisfy you longer than a snack with empty calories. I find that sometimes I can eat only 1 – 2 of the bite-size squares and a cup of tea and I’m good for a couple of hours. So if the ingredient substitutions don’t work, just cut them into smaller sizes. Also, I have another similar recipe posted that might have less WW points: https://thehealthyfamilyandhome.com/raw-hemp-seed-bars-with-cacao-drizzle/. You could always save points and leave off the cacao drizzle. These were awesome! To get around using all of that sweetener, I subbed 1/2 cup organic applesauce for half the honey, and it was still super sweet. I also upped the almond butter to a full cup rather than the extra 1/4 c of coconut oil. Obviously the applesauce makes them not completely raw, but they did come out amazing. I’m sure you could try fresh raw applesauce straight from the blender or food processor, or pureed banana or zucchini for something different, but they may not stay fresh as long. Delicious! Thank you for the great recipe! Hi Kim! Wow…what an excellent idea! I would have never thought of using applesauce. I love, love, love these bars, but I’m going to make another batch of these today using your substitutions because I would enjoy them so much more if they had a little less sweetness to them. These bars look so delicious.. we recently started using hemp, but have been using it only in salad dressings and smoothies.. will definitely give these bars a try.. I am thinking of substituting oats with buckwheat. Hi Mini! Thanks for your kind comments! I am a big fan of hemp seeds and I do the same as you…mostly use them in smoothies and sprinkled over salads. I love when I find different recipes to use them in because they are so good for you. I also use the hemp protein powder and hemp oil. I’ve never used buckwheat before…so you soak it or sprout it first? These are simply superb! Thank you!!! Oh these bars look so delicious and I am ready to make them asap!! Hi Alicia! Thanks and they really are as good as they look!